EDMONTON — Rank-and-file New Democrats handed Tom Mulcair another ballot-box drubbing Sunday, voting to replace him as leader less than six months after a devastating election loss that dashed the party's dream of forming Canada's first federal NDP government. A stunned silence fell over the convention floor at Edmonton's Shaw Conference Centre as delegates realized that not only had Mulcair not attained a respectable level of support, he hadn't even reached the 50-per-cent threshold — unheard of in a federal leadership review. As a result, the man who less than a year ago was being touted as poised to become Canada's first-ever NDP prime minister instead became the first federal leader ever to be rejected by a majority of delegates — 52 per cent — at a party's annual convention. "The only thing that's important is that we leave here united," a calm, resigned-looking Mulcair told delegates after the vote. Mulcair said he'll remain as leader until his successor is chosen, within 24 months. "The person who replaces me must have the absolute and complete support of 100 per cent of the members of the NDP." "We will always be the party that dreams no small dreams," Mulcair said. "We will always be the party that thinks about the little guy." It was clear during Mulcair's speech that he didn't have the support of everyone in the room. But when the results were announced, incredulity descended over the delegates as the magnitude of his loss began to sink in. It was a far worse result for Mulcair than even his fiercest detractors might have expected, the culmination of a festering dispute over the NDP's future direction in the wake of an election defeat that robbed the party of more than half its seats and the spiritual core of its caucus. “I’m saddened by the result, but we live in a democratic system, we have a democratic party,” said British Columbia MP Peter Julian. The party's fundamentals remain strong, Julian added. “Remember, this is a caucus and a party that lost our leader Jack Layton. I came into politics because of Jack Layton," he said, referring to Mulcair's predecessor, who died from cancer just months after leading the party in 2011 to official Opposition status for the first time in history. Julian — a Mulcair backer who praised his leader's resilience in doing battle with former prime minister Stephen Harper — was asked whether he'd be interested in taking over for Mulcair. It's too early for that conversation, he said flatly. A peculiar combination of sadness and relief seemed to emanate from the party's caucus in the wake of the vote. One even called it "ridiculous" that he's staying on as interim leader despite the clear message delegates sent Sunday. Mulcair's fate wasn't necessarily sealed before the convention got under way, northern Ontario MP Charlie Angus seemed to suggest. "I think when we got to the convention, what was really noticeable was the energy and enthusiasm among the delegates and I think it was possible to channel that energy," Angus said. "Tom wasn’t really present for a lot of the convention; people didn’t see him. There was not that sort of interaction. I think New Democrats wanted to be reassured, and they say, 'Tom’s our guy, we’re over what happened last fall, but where are we going in 2019,' and that doesn’t just happen from a fiery stump speech." "A lot of people were crying. We’re very close as a party … you spend a lot of time with someone, you’re part (of) them." Prior to Sunday's vote, Mulcair made one last pitch to the New Democrat faithful to allow him to stay on as leader, urging rank-and-file members to stand with him. In a speech some observers characterized as uninspired at times and passionate at others, Mulcair said he has accepted the blame for the mistakes of last year's disappointing election campaign, but insisted he is re-energized, reinspired and re-engaged after six months of meeting grassroots supporters. 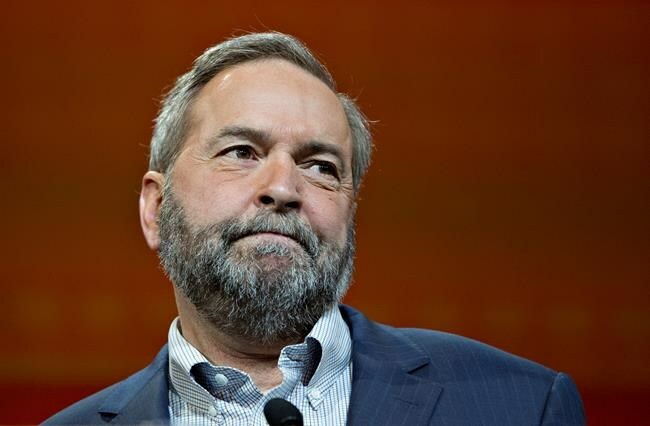 "We made mistakes that cost us a victory in October, and for that I take responsibility," Mulcair said. "I share your deep disappointment in the election results. That’s why we’ve held unvarnished debrief sessions across the country — to understand what went wrong, what mistakes were made, and how we can apply those lessons going forward." In particular, Mulcair made no mention of the so-called "Leap Manifesto," a proposed policy pivot from the left-most factions of the party who want to see the NDP embrace some more drastic measures to combat climate change and aboriginal issues, among others. Prior to Mulcair's speech, delegates voted to adopt a motion to debate the manifesto's ideas and proposals, including some classic left-wing proposals: a move away from fossil fuels, no new pipelines, higher corporate taxes and spending less on the military.